Does the AFL need a send-off rule? The card system used by local leagues could pave the way for the AFL to introduce a send-off rule. In round 20 of the AFL home and away season, footage involving West Coast’s Andrew Gaff and Fremantle youngster Andrew Brayshaw shook the football world. Gaff made a sickening strike to the jaw of his opponent, forcefully removing the Dockers’ midfielder from the game. Brayshaw was rushed to hospital for surgery to repair a broken jaw and three dislodged teeth. Not long after, the 18-year-old was told he couldn’t eat solid foods for four weeks, ultimately ending his debut season. Gaff continued to play out the remainder of the game with utter remorse and despair from what he had just done. The punch resulted in the star Eagle sanctioned for a total of eight weeks by the tribunal the following week. The event, which even brought responses from non-football fans on social media, caused many to question why Gaff could finish the match while Brayshaw was in the back of an ambulance, attempting to remove his mouth guard to assess the damage. The incident sparked national calls for the AFL to consider the benefits and drawbacks of a card system which would impede a player from playing any further part in a match, a system that works intuitively at the local level. 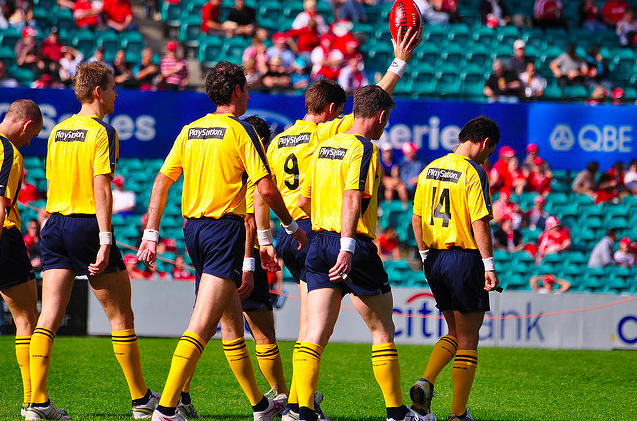 A card system, as conducted throughout many state leagues, would potentially involve a yellow and a red card to be used by umpires on game day. If a player was shown a yellow card, it would result in what is known in rugby as a ‘sin bin’ – the area where the offender sits out of the game for a short period of time. A red card would be used for more serious incidents or events. As seen at the community level, the offender would take no further part in the match if shown a red card by the umpire. AFL CEO Gillon McLachlan has previously stated that he is opposed to the idea, despite calls from the public and legends of the game. However, AFL Players Association CEO Paul Marsh says an argument can be built for the introduction of a card system following the Gaff case. “There’s certainly an argument when you have an incident that is as clear-cut as that one, where one team lose a player for the rest of the match through the actions of a player on the opposing team,” Marsh told upstart. Marsh, speaking on behalf of the AFLPA, knows it’s an issue that can cause great debate. However, he says the AFL would need to conduct a deep investigation into the potential rule change. “It’s a conversation that the industry will have at some point,” he said. If the AFL were to implement a system which would remove players from the game, it would follow a long tradition that local football leagues have used for 30 years, from the grassroots to the senior competitions. Peter McDougall, boss of the Northern Football Netball League (NFNL), says the use of cards throughout local leagues is a system that works to ensure game day situations are put in order following an offence. “Throughout a season, you could have for both junior and senior football up to 500-600 send-offs for a single year,” McDougall told upstart. “A red card means they can’t return to the field of play, they must leave the coaches box, go have a shower and get changed. McDougall stated that if a local community league can achieve order, there’s no reason why the top league can’t introduce a similar system. “AFL umpires are a lot more professional, they’re a higher standard, they’re paid a lot more,” he said. Although the debate for a red card has gained exposure, McDougall said a yellow card is also important for various reasons. “For a yellow card, if a player looks like they are going to do something they may regret or the situation is heating up on field, it can be used to say ‘hey, go and cool your jets, sit on the bench and re-group yourself before you do anything silly’,” he said. McDougall said the NFNL have sanctions and bylaws for repeat offenders. “Two send-offs (yellow card) in a season automatically triggers a one-week suspension, and it continues to increase from there,” he said. At the community level a life ban activates the nation-wide de-registration policy, where action is then carried out by state league officials. “If a player is suspended for a total of 16 weeks in accrued sentences from tribunals, that triggers a policy that ultimately becomes a life ban,” McDougall said. AFL Victoria keep records of repeat offenders and stay on top of anyone who triggers or may trigger the de-registration policy. A case for the red card system will be assessed by the AFL at the conclusion of season 2018, as is done with most rule changes. Photo: Umpires enter the arena and throw the ball by Keith McInnes available here and used under a Creative Commons Attribution.